Petar Tchouhov was born in 1961 in Sofia, Bulgaria. He holds a B.A. in Library Science and an M.A. in Social Sciences. He has published six books of poetry, including Мулето на Педро [Muleto na Pedro: Pedro's Mule] (1999), Провинции [Provintsii : Provinces] (2000), and Малки дни [Malki Dni: Small Days] (2002). 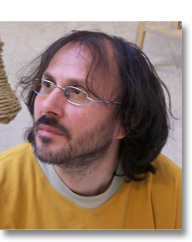 He is the winner of the 2004 MTel text-message poetry contest, as well as recipient of the Development Group special award for the best manuscript for his novel Снежни човеци [Snezhni Tchovetsi: Snowmen] (2003). His haiku and related forms have been published in Ginyu, World Haiku 2006 and 2007, and in A New Resonance: Emerging Voices in English-Language Haiku 5. He was also awarded first prize at the 61st Basho Festival. Tchouhov has played guitar and written music and lyrics for various rock bands and is currently playing with the ethno-rock band Gologan /www.gologan.net ; www.myspace.com/gologanmusic /. He is a member of the Association of Bulgarian Writers, the Sofia Haiku Club, the Haiku Society of America, the World Haiku Association, and Musicautor.